You know what irritates me? When manufacturers, especially ice cream manufacturers, don't put product descriptions on the outside of their containers to describe what is inside the container. Obviously in some flavor instances it's not necessary (vanilla, chocolate, etc.) but when you come up with something like this Blue Bell Southern Peach Cobbler Ice Cream, you'd expect some sort of description (turns out that it is on the half gallon size, just not the pint size). 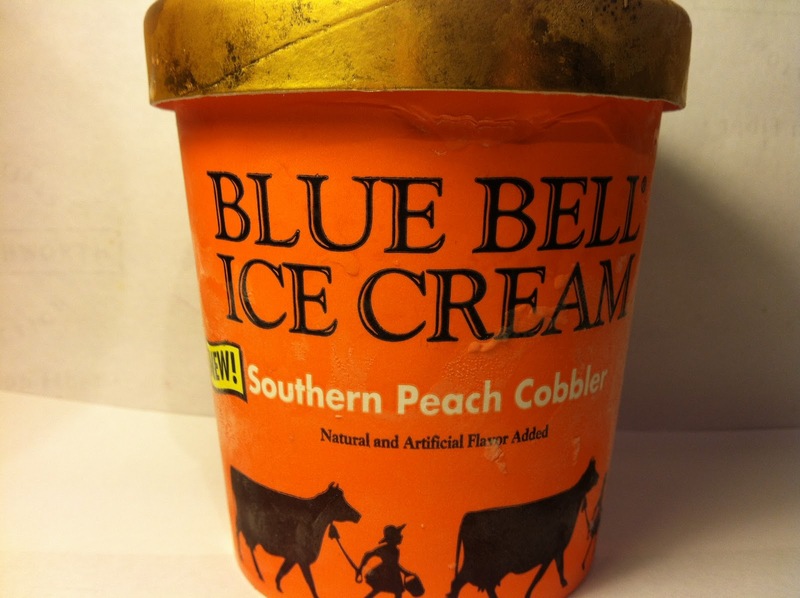 I obviously know what peach cobbler is, but what I'd like to know is what Blue Bell's interpretation of peach cobbler is so that I know what I'm diving into before I actually taste it. So, when I was flying blind heading into this review with not knowing that general info, I was kind of perturbed but since it is my beloved ice cream, I was able to get over it quickly with yet another Blue Bell review. By the way, I picked up this pint on sale at Meijer for $1.67 and it's sixteen ounces (DUH!) and contains four half cup servings with each serving coming in at 160 calories. Since Blue Bell refused to put the product description on the container, I had to track down their website and here's what they've provided: "Luscious peach ice cream with hints of cinnamon and brown sugar mixed with sweetened peach slices, a peach swirl and flaky pie crust pieces." Wouldn't that have sounded great on the outside of the container. Okay, okay, I'll let it go. Anyway, when I opened the pint (prior to reading this description), I could definitely tell it had peach ice cream based on the color of the ice cream and also the mild peach smell. I was also able to see the peach chunks, so we were good there too. One discrepancy between what I was able to see and what was in the description were the pie crust pieces. I expected that they'd be there because this was indeed modeled after peach cobbler, but all I could mostly see were peach chunks and only the occasional pie crust piece. So, I've got to say I was disappointed by that. I've also got to say that while they say there is a peach swirl in here, I never saw one of those either. Someone must have taken this pint of ice cream to a costume ball prior to it arriving at the store because a lot of what I thought were peach chunks actually turned out to be pie crust pieces and brought crunch to the pint, so I was quickly corrected and happy to find their crunch in the pint. The peach pieces pretty much tasted as you'd expected frozen peach pieces to taste (hard and peachy), so they also brought an additional crunch to each spoonful that I encountered them, although I don't think crunchy peach pieces were Blue Bell's intention. As for the peach ice cream itself, it definitely had a peach flavoring, but it was very mild and smooth. 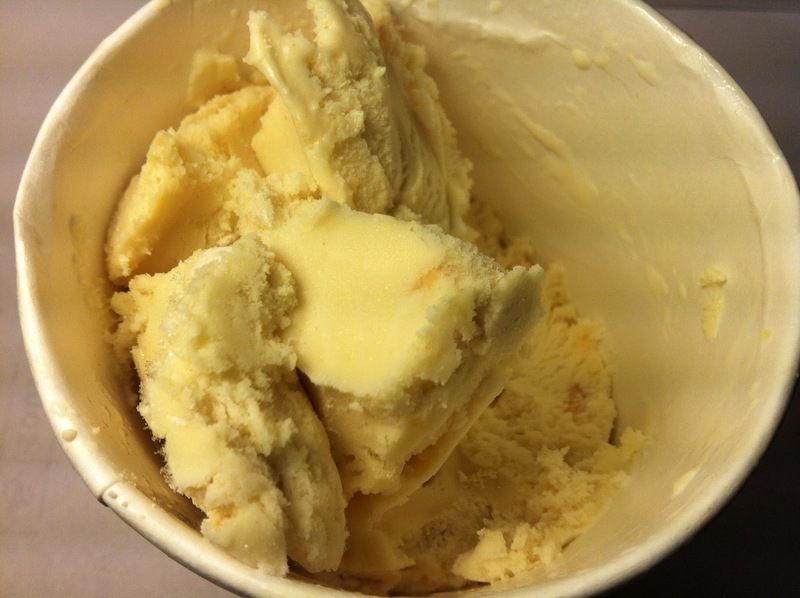 The brown sugar in the ice cream was hardly noticeable, but the peach flavoring, while extremely mild, was noticeable enough that you definitely knew what you were eating. Buy It or Fly By It? This is a tough one because there was nothing wrong with this flavor, but nothing about it screamed awesome and makes me want to give it a strong positive rating or even a negative rating. The fact that it was pleasing enough gets it a BUY IT rating, but not an overwhelming one. I wouldn't tell anyone to stay away from this, but there are better flavors out there in the Blue Bell product line that I'd choose before this one. That said, if I did want some variety and/or this was the only flavor that was available to me at the time, I'd be okay with it. For another review, check out The Ice Cream Informant. Completely agree that the product description sounds gorgeous, they should totally put that on the packaging! There is a serious lack of peach ice cream in the UK, which is such a shame as it's a lovely flavour. I get so annoyed when there's not a description, too! I'd like to know what I'm eating haha. I love Blue Bell! I love the amount of mix-ins they put in Chocolate Chip Cookie Dough. Would you say that there was a lot of pie crust pieces? How does it compare to the number of mix-ins in CCCD? I actually had two different pints of this flavor and one of them had a lot of pie crust pieces and the other had hardly any, so it seems kind of like it is hit or miss. Just depends on if you are lucky that day! Hiya! Do you own any journalism experience or this is a pure natural talent of yours? Can't wait to hear from you. LOL, no experience. Just a hobby. I grew up on peach cobbler and make it often. I love the pieces of pie crust but not the big chunks of frozen peach. Therefore, rather than waste a half gallon, I made a shake with whole milk, the ice cream, and a few tablespoons of peaches in heavy syrup. Love your review.